Though most spiders are relatively harmless, the brown recluse is one of few spiders in the United States that have the potential to be quite harmful to humans. It is usually found in warmer areas of south central and Midwestern sections of the country. Receiving a bite from a brown recluse can lead to skin lesions and in the worst case, death. Recognising a brown recluse infestation is taking place is the first step in the process of ridding your home of brown recluse spiders. To determine if a location is infested, one must first identify the spider. Afterwards, one can search for indications of their presence, like finding shed skins or webs. Despite how the pictures might depict them, brown recluses are actually quite small, growing no larger than three quarters of an inch (~20 mm) across. As their name implies, their color is typically a uniform brown color, however some variations can be gray or off-white. Unlike most spiders, this spider only has six eyes instead of eight. The brown recluse is often confused with the woodlouse spider due to them sharing similar physical appearances (e.g. six eyes, brown). The greatest piece of evidence of a brown recluse tends to be the spiders themselves. Despite their bite being quite nasty, it is not considered dangerous to search for brown recluse spiders. This is because they, like many other spider species, tend to leave humans well alone unless provoked. Additionally, they would rather not be disturbed, so searching for quiet, dark areas will be more likely to yield results. Attics, closets, and basements are all ideal locations to begin a search, as well as baseboards or beneath loose carpet. When trying to find evidence of a spider infestation, keep in mind that these are nocturnal creatures. As such, searching during the day will yield little results, since they will likely lay dormant until night, where they travel or hunt for food. When the sun is out, they will hide themselves in undisturbed, dark areas. Most will be content remaining in their webs all day. The web of a brown recluse is nearly always built in quiet, dark corners or crevices. Examining a web can assist you in identifying an infestation of brown recluses. The appearance of a web is generally irregularly shaped, made from gray or off-white sticky fibers. The males have a higher tendency of wandering further from their web, whereas females tend to stay closer to them, especially if they are defending eggs or young spiders. Young spiders can grow quickly, and will molt frequently as a result. Shed skins are known as moltings. 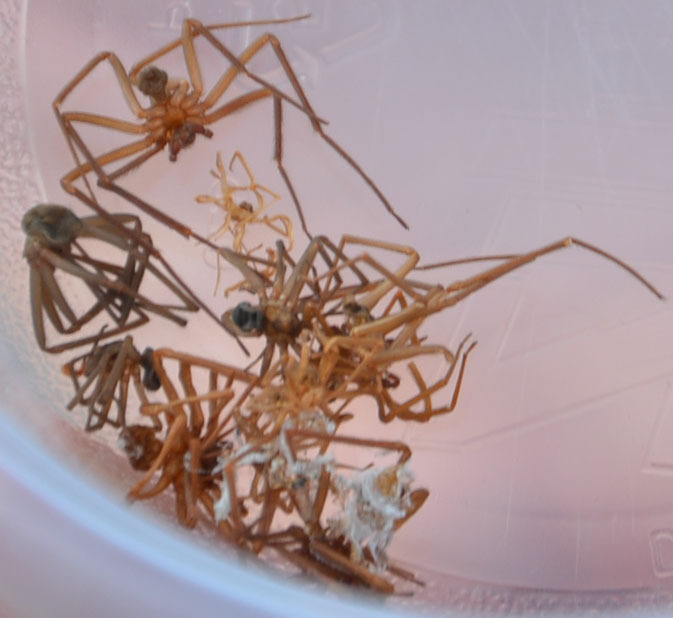 The stiff discarded moltings are a telltale sign of the presence of brown recluse, and finding an abundance of them may be good evidence of a brown recluse infestation. Want to avoid spider infestations in the future? Check out my article on how to repel spiders naturally.